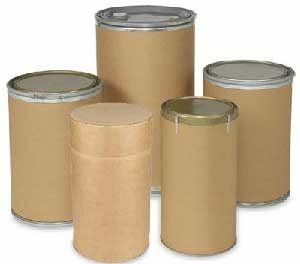 Today, a lot of companies and industries make use of fiber drums for storing and containing finished products. These fiber drums are highly durable and easy to use. They also provide adequate protection for many products. One of the major advantages of using fiber drums is because they are easy to use. You can easily open the lids without applying much pressure. The fiber drums also feature a filling space that is large enough to contain your products. What’s more, fiber drums are light in weight and provide offer easy access. Thus, making dispensing products and filling up the drum relatively easy. Also, stacking and arranging of fiber drums is easy as well. Furthermore, all fiber drums are made using craft paper liner board. They can be made with a multi-wall construction. This helps in providing adequate protection for any product stored in the drum during filling, storing, shipping, and dispensing. In addition lock ring drum, all fiber drums feature positive flush tape seal and telescoping cover. These help in providing extra rigidity, thus, making the interior portion of the drum very smooth. Fiber drums help protect your products. Finally, fiber is an ecofriendly product that is 100% recyclable. This makes fiber drums completely safe for the environment and reusable. Thus, all fiber drums less likely contribute to environmental pollution and waste if recycled properly. There you have it! Above are some of the advantages of using fiber drums. Fiber drums are ideal for several commercial and industrial processes that require shipping and storage. Contact us today to know more about our fiber drums. We have quality all fiber drums and lock-rim fiber drums that will serve you for an extended period.